Pink, pink and more pink! 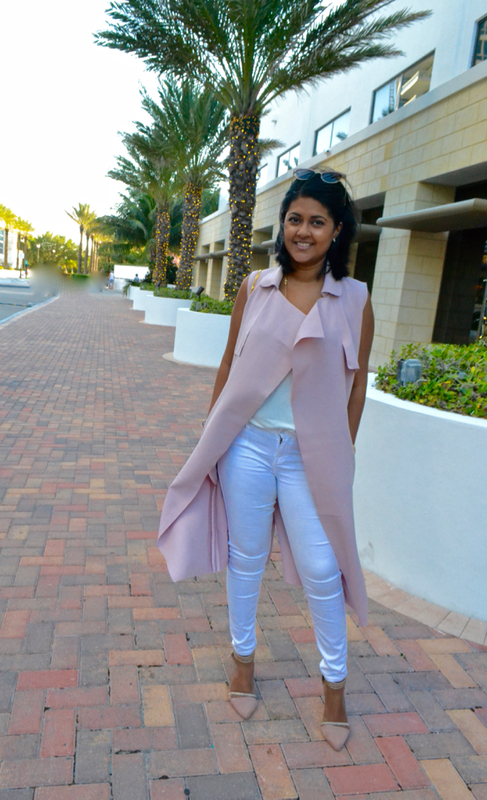 Yes, I love pink and I am loving this sleeveless lapel coat from SheIn! This site is an online retailer that sells trendy and affordable clothes. You are able to find a range of stylish pieces from bomber jackets to ruffled sweaters to long jumpsuits. The prices are extremely reasonable and with their wide variety of clothing, anyone is bound to find something they like. I have been in Miami for the past few weeks enjoying my maternity leave in the sunshine. I figured it didn't make sense to be stuck in the cold so I headed home just in time to celebrate my birthday down here. 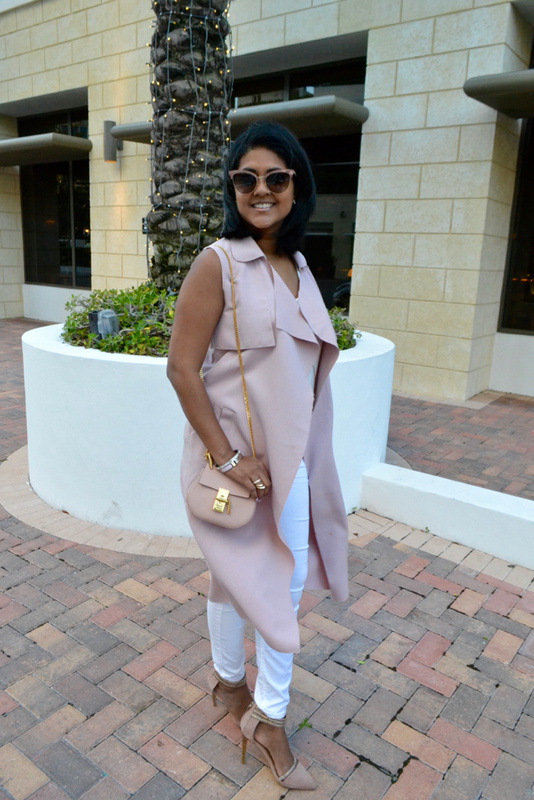 This coat fits right into the Miami style and weather. 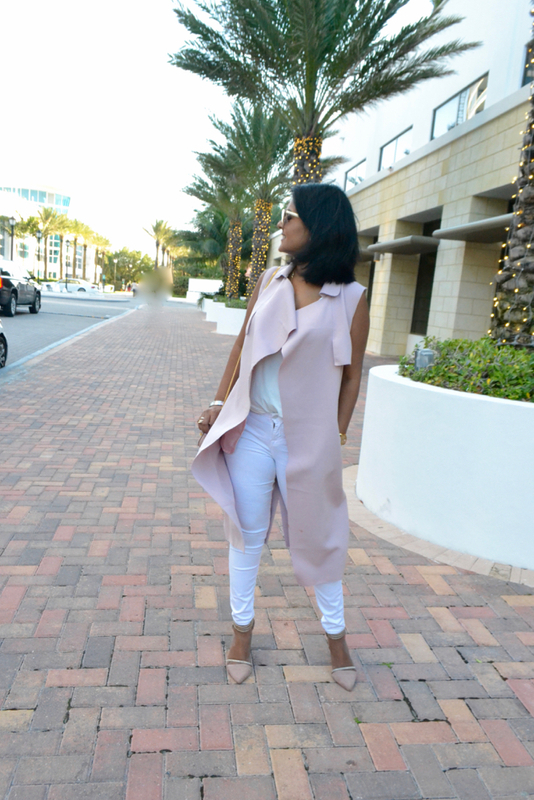 The day after I landed, my husband planned a birthday brunch on South Beach and I kept it casual with white jeans and a tank top but wore pink accessories to match the sleeveless coat. With it only being two months since giving birth, it was nice to be able to fit into my jeans but they were still a little bit tight so this coat really helped to camouflage those areas that haven't quite bounced back as yet. In addition, the coat looks exactly as I expected from the online shop and the material is quite heavy. It feels like a solid, sturdy piece and the color is great. I am very satisfied with this selection and would purchase from this site! I may not be looking forward to heading back to the cold but this coat will look great in New York in the Spring. Combine with a necklace and black mini dress with sleeves makes me feel really good.The reunion went perfectly after that. Thanks for your article wise suggestions and I highly recommend you to try this dress out as well!